A-frame metal carports, also known by the name of boxed eave carports, feature a more traditional roof design with protruding eaves on either side of the roof. The center gable runs down the length of the structure, but it’s still covered with a single panel rather than the trim pieces required for completing a vertical roof. This leads to faster and simpler roof installation on your new carport. The A-frame roof sheds water well and matches the roofing used on most homes and some businesses. The boxed eave design with partial upper walls blocks high wind flow while allowing for good ventilation below. 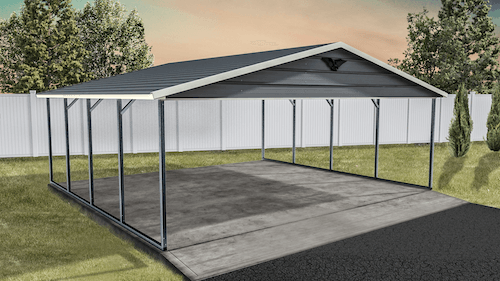 Can You Really Replace a Garage with an A-Frame Steel Carport? With a little design consideration at the beginning of the process, you can make any of our A-frame metal carports into a structure that could replace a far more costly and time consuming garage. Add four walls, a bay door, and some security features and you’ve got the same enclosed space for storing boxes and tools aside from parking your car under a roof. You’ll have a dry, clean, and level space for working on your car and storing tools and spare parts between repairs. Compare the costs of installing one of our A-frame steel carports with a complete garage before deciding between the two. Vertical roof carports also feature an A-frame structure design, but the panels on the exterior of the roof featuring a completely different orientation and installation style. Boxed eave carports always feature horizontal panels like regular roof carports, while any carport featuring a vertical panel orientation is known as a vertical roof model. Vertical roofs feature panels running vertically from the high point at the gable down the eaves on both sides. This is the same installation style you’ll find on any sloped metal roof for a home or business, but it’s more costly than A-frame designs with horizontal paneling. A-frame metal carports balance out the durability of an A-frame structure with the fast installation and affordability of a horizontal roofing design. MetalCarports.com has all three styles of roofing for carports, allowing you to choose the one that is right for you. Request a quote today for one of our popular A-frame metal carports or check out the other categories for more options.